When I was teaching young primary school kids, I loved introducing picture books to my classes that motivated them to write. One of my favourites was The Jolly Postman, by Janet and Allan Ahlberg, (Heinemann, London, 1986). Our copy, gifted to my son in 1990, has a hard cover, the size of an envelope. Inside is the story of a postman, and the letters he delivers to different characters living in fairyland. The first is for Mr and Mrs Bear. The page is an actual envelope, stamped and addressed, and inside is an actual folded paper which is a letter from Goldilocks, beautifully presented with child-like drawings and spelling. and inside is a flyer advertising "everything for the modern witch". Followup discussions about the kinds of material people receive by mail invariably mentioned this one. 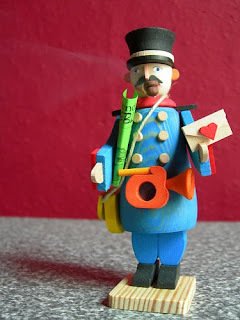 What fun to imagine the sorts of mail characters like Georgie Porgie would receive! I love the way the Ahlbergs give lots of hints about recipients and leave room for speculation without needing to spell everything out. There are more letters, interwoven with the postman's journey and reaction to his customers. The text that links each letter is rhyming-ish, but the standout feature is definitely the letters. It's not an easy book to read aloud, because of all the stopping to remove and read each communication. That has never been a problem for me, even though I look upon reading aloud as a performance. Children just love the real letters, love to unfold them and examine them and dream about them. Performance is not as important as passion. There are many ways to use this book as a springboard, whether at home or at school. Letter writing is motivating when you have a reason to communicate with someone (authentic audience), and my young students loved to write each other letters. We used a classroom tricycle for delivery sometimes, or the class mailbox (recycled shoe box.) We wrote letters to our favourite literary characters, letters to the school principal, letters to relatives, and letters to penpals. Older students wrote letters from literary characters, taking on a role and trying to use language that suited the chosen character. They wrote letters to the editor of our local newspaper when something roused their passion. We studied fairy tales and nursery rhymes and investigated their place in history and in literature. They also used The Jolly Postman as a model for their own picture books, complete with inner envelopes and folded letters. Do keep an eye open for this one. From what I can work out, my copy is now out of print, but Amazon seems to be offering the same book with a different cover. I highly recommend it as a resource for home, and for classrooms where kids look after books.